large but delicate sculpture of stainless steel spirals and curved triangles. The sun had already slipped behind the surrounding buildings by the time they got the structure in place and the sculpture’s extreme reflectivity at times made it seem almost invisible in the evening light. The stainless steel welded framework — looking a bit like a spinning top on its side — forms a three-dimensional representation of a Fibonacci spiral. On a sunny day, from some angles, the sculpture shines as brightly as a spotlight. From other angles, the work virtually disappears from sight, reflecting the surrounding buildings and trees and sky. The work crew — composed of sculpture professor Craig Wedderspoon; arts technicians and alumni Patrick O’Sullivan and Mike Eddins; ceramics MFA candidate James Davis; BFA major Eric Nubbe; and the artist, Lindsay Jones Lindsey — lugged the sculpture from its lair in the Bureau of Mines out to its new home in the Woods Quad Sculpture Garden. There they dug holes, poured concrete to make pylons and bolted the sculpture in place, the final steps in a process that Lindsey says started almost four years ago. Lindsey, who was a 2012 BA major in art with a concentration in sculpture, and a triple minor in biology, Computer-Based Honors and the Blount Undergraduate Initiative, began designing the piece in 2009, her sophomore year. The sculpture began in a collaborative lighting initiative, “Light As Material,” that brought together students in Wedderspoon’s ART 131 with classes in the College of Engineering, and the Interior Design Program in the College of Human Environmental Sciences to develop solutions for areas on campus in need of lighting design. As part of this class, Lindsey conceived and developed a design that would use mirror-grade stainless steel so that she could also use the reflective nature of the light as a medium in the sculpture. But her ideas didn’t stop there. 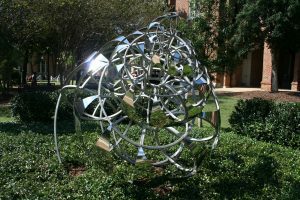 With Lindsey’s interests running into science as well as art, particularly biology and math, the sculpture grew into a harmonic convergence of all three in the Fibonacci Project. The sculpture’s structural design is based on the Fibonacci numbers, a mathematical sequence in which each number is the sum of the previous two numbers. The sequence is also found in structures in nature, for example in the arrangement of a pineapple or a pinecone, or in the spirals of ferns or the chambered Nautilus. Lindsey incorporated the Fibonacci sequence of numbers into different elements of the sculpture. Its basic framework is circles inside a three-dimensional spiral, made from square metal tubing. Each circle’s diameter grows in proportion to the Fibonacci numbers. The framework spirals upward in Fibonacci proportions and is webbed with shiny, sail-shaped curved metal panels whose shapes echo the inside of a Nautilus shell, which also follows the Fibonacci sequence. She readily acknowledges all the help she has gotten from others in creating the sculpture. “I feel that so much of this project has not been just me, but everybody,” she says. Her entire family has supported her from the beginning, and several Alabama alumni came to her aid when she thought she had hit a roadblock in the process. Lindsey’s father, Gregory Jones, has helped her at every turn, beginning with the first and second models. “The shape of the panels was his idea,” she says. They worked on the initial design together and he has helped her manipulate materials when she was physically not quite strong enough to do it by herself. Once she finished the design, she wrote a full-length paper describing her project, which also includes an education component to teach students about the art, science and math represented in the Fibonacci Project. She and her sculpture professor Craig Wedderspoon went to then-provost Judy Bonner for permission to make it a reality. The Office of the Provost under now-president Bonner not only gave permission but also funded the entire project. Now the individual parts were ready to be crafted and welded together. To have the triangular sail-shaped metal panels fabricated, Lindsey first made patterns from poster board and then scanned them. Before she could send the digital scans off to be made into panels, she first had to find a way to convert the digitized templates into computer-aided design or CAD files — and she had no idea how to do it. Kyle Cruz, a 2009 graduate of CBHP, answered her call for help. He took the jpeg images Lindsey had created and converted them to CAD files so that they could be sent to the machinist. Other friends gave immeasurable assistance and support, Lindsey says. Matthew Jordan of Fitz-Thors Engineering – another UA alumnus who received his BS in engineering in 2010 – cut all the metal for the project at no cost. “Matt arranged the CAD drawings to fit onto two 4’ X 10’ pieces of the mirror–polish stainless steel sheeting. Then he used a plasma cutter to cut the pieces out,” Lindsey explained. Mike Eddins, a UA art alumnus who also received the BA in New College, now works as assistant arts technician in the Department of Art and Art History, and has worked closely with her. “Mike and I rolled each sail shape in the hand cranked roller to give it a slight curve. Each piece has a compound curve, so after rolling it, we forced the opposing curve by hand. Then we drilled holes in all three corners and then attached the sail shapes with rivets.” Eventually it all came together in the Woods Quad Sculpture Garden this fall. Lindsey currently works in the emergency room of DCH Medical Center and “loves it,” she smiles. She is applying to UAB and USA for medical school and hopes to specialize in reconstructive surgery or emergency medicine after completing her degree. She is high energy, but with an inner calm and self-assurance that comes from knowing she has an incredible support system of family, friends and colleagues. The result of this effort over the last three and a half years now rests in the Woods Quad Sculpture Garden, tipped a little to one side and pointing upwards into a reflecting sky. The Fibonacci Project with Lindsay Jones Lindsey at its helm will continue to bring together the marvels of research into nature and art, science and math, as well as some teaching and service to The University of Alabama. Originally published in The Loupe, the newsletter of the UA Department of Art and Art History, Fall 2013.